Back to school is such a frantic time with parents either having their little ones taking their first steps into school or going back into their next year. From uniforms, to lunches and stationary, there is so much to think about – and school shoes are a big one. Question: What's most important when picking out school shoes? Sophie McLellan: There are three important factors parents need to consider when picking school shoes for their child: fit, needs and compromise. When it comes to fit, parents need to ensure the shoe is not too long or too short and the width suits the individual foot. Foot shape and growth patterns vary from child to child. It is important to ensure you select the correct shoe size and style in order to ensure there aren't further knock on effects further up the chain from the feet to the knees, hips and so on. For example, if your child is pre-school age, wearing shoes that are the incorrect size can be detrimental to their development as at this stage they are still establishing their gait. Similarly, a shoe that is too big or too small can cause excessive movement or restriction which may result in friction and blistering and toe deformities. Parents must also pick a shoe that fits the needs of the child who will be wearing them. Depending on level of activity, different styles will suit different kids. For example, a very active child puts more stress and pressure on their footwear than a child who doesn't run around as much and as such should choose a more robust style. Weight is also an important factor, different styles can be lightweight and others more robust and heavy. Essentially, you must consider the activities your kids take part in and the style they like in order to get the best result. A common complaint from parents, is their child not wanting to wear their school shoes because they don't like the appearance. When your child likes a pair of shoes as much as you, it makes it a lot easier to get them to wear it. We have found parents have more success getting their children to wear appropriate shoes when they engage with their kids and give them the opportunity to join in on the selection process. Question: What are the most common mistakes parents make when choosing school shoes? Sophie McLellan: Worrying about cost versus quality. When a parent comes to the clinic to discuss their concerns about spending a chunk of money on their children's school shoes I always remind them of the above and that once the cost is broken down they are paying roughly $0.50 - $1.00 per day for a good pair of school shoes that will last the distance. Realistically, kids get roughly 700 hours wear out of their school shoes or about half a year before they start to show signs of excess wear that can lead to problems. When they consider how important the developmental outcome for their kids is and how much they rely on their shoes, parents generally understand why spending a bit more money isn't such a big deal after all. Question: Is Velcro the same as laces in terms of support? Sophie McLellan: We have purposely designed an extensive collection based on the fact that every child has very unique and individual foot requirements. Our ranges have three levels of support – Natural, Moderate and Optimal stability – across four collections and 17 styles. So whether your child prefers velcro or laces, they will be getting the exact amount of support they require. So rather than choose by appearance, consider the closure that is easiest for your child. There are plenty of 10-year-old's out there who can't tie laces. If it is a big issue, each morning, then perhaps it's wiser to select an option that allows them greater independence during what's already a rushed time of the day. Question: How can we negotiate with little ones who may be picky on style? Sophie McLellan: This is a challenge a lot of parents face. Our biggest tip is compromise and engagement. Getting them involved in the selection process is the best way to get them on board with a school shoe that ticks all the style boxes as well as the fit, form and function boxes. All our Skobi shoes are designed for the specific needs of children, so if a child loves to run we will tell them about the features in the shoe that will make them the fastest runner in the playground. Question: What types of signs should we look for in our children's foot health? Sophie McLellan: There are a couple of signs parents should keep an eye on so they can ensure their child's foot health isn't declining. These are mainly mechanical (walking), and physical (skin and nail issues) and are generally a product of incorrectly fitting shoe. If you see your child flicking out their legs when walking, the shoes are likely too big for their feet, compromised their gait as a result. Children tend to do this when their shoes are too sloppy and want to reduce the chances of tripping. If you notice blistering and/or abrasions on your child's feet, we recommend observing or asking your child whether the shoe is rubbing or causing friction when they walk. If this is the case, the shoes may be either too big or too small. On occasions, we notice children shortening their stride, or clawing their toes because of ill-fitting shoes. Commonly they are compensating in order to avoid pain or discomfort, or simply to hold the shoe on. Another important physical sign of poorly fitting school shoes are pressure points that develop while wearing smaller shoes for long periods of time. Not only may this cause your child's gait and walking habits to change but it may also have implications on the rest of the body. There's also a chance of ingrown toe nails developing, which can be very uncomfortable! Question: Are there shoes that are school, style and health appropriate? Sophie McLellan: While there are some options on the market, the options are not versatile and really do not take into consideration the reality that no two feet are the same. Nor are any two children the same for that matter. There was a great gap for quality shoes in the market and we noticed our customers really struggled to find not only the right fit, but also shoes which were aesthetically pleasing for their children. That's why we developed our own specifically designed school shoes that could accommodate orthotics and other needs of every day Aussie kids – Skobi. Question: Can you tell us about Skobi? 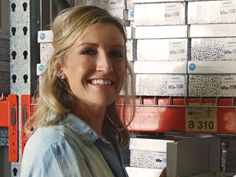 Sophie McLellan: Skobi is the first school shoe range of its kind in Australia, specifically designed by Paediatric Podiatrists and loved by kids. The one size fits all approach just doesn't cut it for our Australian kids anymore so we decided to do something about it. The Skobi Range comprises of four collections purposefully engineered for Aussie Kids, and includes options for children with sensitive and fussy feet, as well as the rough and tumble kids who love to be active in the schoolyard. The unique and stylish designs offer the ultimate feel, form and function with a variety of features to ensure there is a shoe to fit every kid's foot. Question: What was the idea behind the development of the Skobi shoe? Sophie McLellan: Every kid is different. As parents, it's one thing to find a school shoe that your child likes but actually finding one that also meets their needs is a whole new realm of frustration. Initially, we stocked a number of different school shoe brands at our clinic, Little Big Feet, for parents and their kids but we were still finding there was a huge gap in the market for quality shoes that considered our unique climate and our kids. Parents were in need of European quality shoes tailored to the Australian environment however there were none available. When you think about it, children spend over 80% of their day, Monday to Friday, in their school shoes. That's running, jumping, skipping and all the rigorous fun of the school's concrete playground. So knowing how much time our children spend in school shoes and how footwear can positively or negatively affect the running and walking gait of our kids, my husband, Jason, and I decided to create the ultimate school shoe range. We decided to actually put children and all their individual requirements at the forefront of a school shoe design and that is how we came up with Skobi.